In 1864 St. Patrick’s parish opened an Immaculate Conception Church for Catholics living far from its downtown F Street home. This imposing Gothic style building was completed a decade later. Renowned actress Helen Hayes was baptized here in 1900. Immaculate Conception’s community work included its Washington Catholic Hour radio show on WOL (1921-1962). For 99 years, until 1964, the church operated Immaculate Conception School for boys at 711 N Street. It is now an elementary school. Girls attended Immaculate Conception Academy nearby at Eighth and Q streets until 1954. 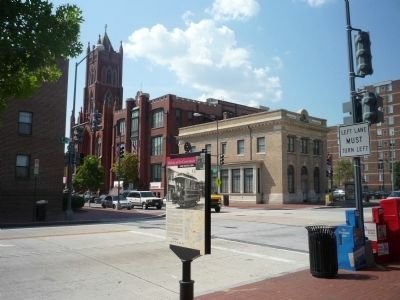 After much of this area was destroyed in the 1968 riots, Monsignor Joshua Mundell worked to stabilize the neighborhood, encouraging church and federal government collaborations to build modern apartments. The Seventh Street Savings Bank building is a remnant of the block’s business era. The combination bank/residential building opened in 1912. After many mergers, it closed for good in 1983. Avenue to Rockville, Maryland. At first omnibuses (horse-drawn wagons) carried passengers along Seventh. Then in 1862 Congress chartered street railways, with a Seventh Street line. Leading abolitionist Senator Charles Sumner made sure that the charter prohibited segregation on the streetcars. 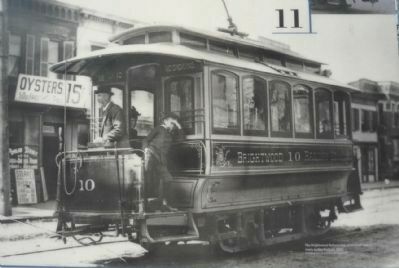 The first electric streetcars (1888) ran along New York Avenue to Seventh, but in 1962 were replaced by buses. The latest innovation, Metro’s Green and Yellow subway lines, opened in 1991 after seven years of construction. Location. 38° 54.427′ N, 77° 1.309′ W. Marker is in Mount Vernon Square, District of Columbia, in Washington. Marker is at the intersection of 7th Street Northwest and N Street Northwest on 7th Street Northwest. Touch for map. Marker is in this post office area: Washington DC 20001, United States of America. Touch for directions. with Immaculate Conception Church and the 7th Street Bank Building in background across the intersection. (about 500 feet away); “Sweet Daddy” Grace (about 700 feet away); Power Brokers (approx. 0.2 miles away); Alley Life (approx. 0.2 miles away); Blanche K. Bruce House (approx. 0.2 miles away). Touch for a list and map of all markers in Mount Vernon Square. This machine, photographed below Seventh and L sts., bored subway tunnels. Related markers. Click here for a list of markers that are related to this marker. Immaculate Conception Catholic Church is listed on the National Register of Historic Places. More. 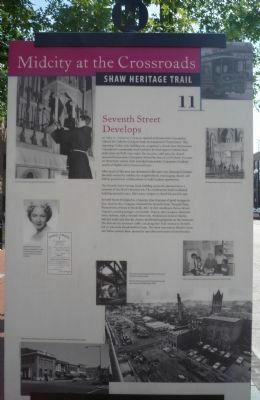 Search the internet for Seventh Street Develops. Credits. This page was last revised on March 23, 2019. This page originally submitted on November 8, 2009, by Richard E. Miller of Oxon Hill, Maryland. This page has been viewed 828 times since then and 11 times this year. Last updated on March 8, 2019, by Devry Becker Jones of Washington, District of Columbia. Photos: 1, 2, 3. submitted on November 8, 2009, by Richard E. Miller of Oxon Hill, Maryland. • Bill Pfingsten was the editor who published this page.